A disgraced professor leads a documentary film crew on an expedition to prove that Frankenstein’s Monster was not only real, but is still alive in the Arctic Circle. November 2012 – Professor Jonathan Venkenheim plans to lead a documentary film crew on an expedition to the Arctic Circle. The documentary crew consists of on-camera talent Vicky, cameraman Luke, soundman Brian, and producer Eric. When he was 10 years old, Jonathan’s grandfather showed him letters that were the basis for Mary Shelley’s Frankenstein. Jonathan claims that her novel is nonfiction and that Victor Frankenstein was based on his grandfather’s great-great-grandfather Johann Venkenheim. Johann was a member of the Illuminati who did early genetics research on longevity. He combined animal and human DNA to create a creature that could resist disease and live for centuries. Johann destroyed his notes after the creature was created. On the way to the second day of interviews, Vicky nearly hits a man with her car. Jonathan’s girlfriend Anne is growing tired of his work. The crew is skeptical about Jonathan’s theory. Canada, Day 1 – Jonathan and the crew travel to the Yukon. They first stop to interview a man named Clarence who claims to have encountered the monster. He is also an unstable meth-head who pulls a gun on the crew and sniffs their wallets. Deline, Day 2 – The crew meets with their grizzled guide Karl and transfers their expedition to three snowmobiles. On the way, Anne breaks up with Jonathan over the phone. Northwest Territories, Day 3 – The crew makes camp. Karl tells everyone not to mind the wolves. Camp Site, Day 4 – The crew makes their way to a yurt in Potter’s Gulch. Bones are found in the snow nearby. Luke thinks he sees a shape moving in the distance while filming the landscape. Jonathan reveals a map that shows how he has traced caribou migration and unexplained spikes in homicides and disappearances to track the creature’s movement pattern. Brian is upset when he learns about the deaths and disappearances. Karl shares his alcohol with the crew. Brian finds a dirty old doll that Jonathan asks to examine. Wolves are heard again during the night. They stop howling at the sound of something else. Eric says it is a bear, but Jonathan claims it is the creature. Potter’s Gulch, Day 5 – The crew awakes to find one snowmobile trashed and another one missing. Karl takes his gun and follows footprints in the snow towards the woods. After Karl is gone for four hours, Brian and Eric take the remaining snowmobile to search for Karl. They follow a blood trail into the woods and discover Karl’s body. Luke takes the snowmobile to go for help while everyone else waits at the yurt. During the night, the monster is heard again outside. Day 6 – The group follows Luke’s tracks. Brian finds Luke’s body and is then killed by the creature. The three survivors return to the yurt to find the monster there. Jonathan attempts to approach the monster while the other two go towards the yurt. Eric runs and is attacked. Jonathan and Vicky make it inside. Day 7 – Jonathan tries reasoning with the creature but he is killed offscreen. The creature then tears the door off the yurt and carries Vicky away along with the doll. 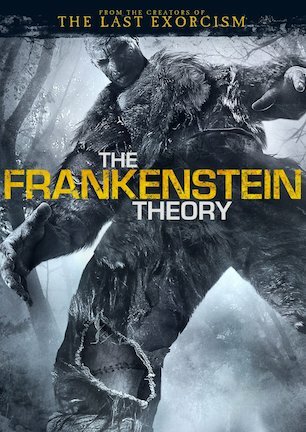 “The Frankenstein Theory” takes an original premise and douses it in an unoriginal presentation. Which is not to say that the mockumentary does not do it well. It does. There was just potential to chart new territory until the title opted for the same path trod by every similar film to come before it. Jonathan Venkenheim has an absolutely batspit crazy theory that Mary Shelley’s classic tale of Frankenstein and his monster was in fact discreetly veiled nonfiction. Venkenheim happens to be a descendant of the equally nutty professor upon whom Dr. Victor Frankenstein was supposedly based. Not only is the creature real, it is still alive and living in Canada. With a documentary camera crew and a grizzled wilderness guide at his side, Venkenheim sets course for the Arctic Circle to prove his theory is fact. If you just said the word, “seriously?” through a disbelieving guffaw, not to worry. The film crew on hand to record the expedition shares that same sentiment. Silly or not, the idea is too fun to not already be onboard. But the suspension of disbelief is made that much easier because the crew recording the journey thinks the whole thing is hokum, too. “Found footage” films often have an overeager host of some imaginary television program searching for evidentiary proof of the paranormal. Then he always seems surprised when he actually finds it. Here the crew is skeptical to the point of blasé about their assignment. It makes them more identifiable than that wide-eyed TV host since we are on the exact same arc of discovery with the story. These kinds of movies generally have to find at least an hour of filler material before anything truly spooky starts happening. Thankfully, “The Frankenstein Theory” has a likeable cast to push the story over that traditional hump. Soundman Brian always has a snarky remark at the ready. Producer Eric utters few words, yet provides commentary through bug-eyed facial expressions. And even though it has no impact on the story, a scene with a wallet-sniffing, gun-pulling clone of Giovanni Ribisi is a worthwhile diversion specifically because of the interesting characters. The first impression of actor Kris Lemche is that he is too young and well groomed to play a mad university professor. But by the time he points to a map and convincingly describes how he traced the monster’s migratory patterns, Lemche completely sells the character with all the nuances of academic studiousness and loony ambition. He also successfully sells the professor’s theory as not so unbelievable after all. The letdown with the movie is that its Frankenstein angle more or less morphs into a MacGuffin to put the characters out in the wilderness and in the path of danger. As if it was not crazy enough that Frankenstein’s monster is real and living in Canada, the backstory adds the Illuminati, Dr. Moreau-style animal-human hybrids, DNA longevity research, and secret gene splicing experiments. Yet none of that really pays off. The last act of the movie is structured in such a way that it turns out the group could have been searching for simply a really large polar bear and little about the story, or any of the Arctic scenes, would have changed. There is nothing uniquely “Frankenstein” about what ends up happening, and that is a missed opportunity, as well as a disappointment. The movie is unrated, although it would likely score a PG-13. What little blood is shown is in the form of trails in the snow and all of the deaths occur offscreen. That is either bad news for those who need more visceral thrills, or good news if you want to watch with someone squeamish or of the younger set. “The Frankenstein Theory” follows the “found footage” formula to a fault. Likeable characters are introduced, the danger escalates gradually, and then everyone disappears one by one. It could be pointed to in film schools as a “how to” reference guide, which would be a greater compliment if it were 1999. It is well made, aided immensely by the fantastic winter scenery, but it succumbs to an unoriginal routine that does not distinguish “Frankenstein” from its genre counterparts. The movie feels above that. Even with the markings of something unique, its pieces are instead used to build a film that has already been done. It leaves me wondering if “The Frankenstein Theory” stands out more for its premise that goes unfulfilled than for anything else.